A few planes are given life, me rambling, trying to share my ways of working and a little of my self. I needed a small scraper plane, had bought a German toothing plane blade some time back and finally the reason I took off, was a old friend who wrote me, that she and her husband needed a small hand plane, that they can use when making arrows for bow shooting and other nature activities. 2. Old iron, new life. 4. White glue and patience. Perhaps this can inspire others to make tools. Nice work. Always a treat to see your posts. Very nice. I also loved your blog about it. When I look you post, it looks so simple to make them, but I doubt I could make one successfuly. That is one fine collection you have made!! 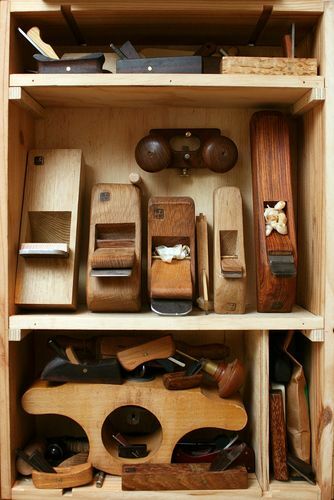 That is a nice array of planes that you have made with love and care using a self made plane will return the love every time you use it .There is nothing like a tool that has been given to you or one you made for yourself or sent as a gift to another craftsman. I appreciate the extensive blogging you do and it certainly will inspire many of us ! Awesome planes … amazing !!! An excellent bunch of planes, or should we call them a squadron! They are just itching to be used. That surely is a beautiful collection of planes that you have there. Congratulations.